Art ‘N Soul allows you to book your own private paint and sip event!! Enjoy the entire studio to yourself for any birthday party, bachelorette party, baby or bridal showers, corporate parties and team building workshop events or whatever else you can think of! Don’t forget that we operate as a bring your own beverage studio so please feel free to bring any beer, wine, non-alcohol beverages, and food. When it comes to food we can accommodate everything from munchies to potlucks or even a full blown catered event. We supply all plates, cups, plastic-ware, napkins, wine glasses, bottle openers, a refrigerator, and designated food tables. So please feel free to bring anything you need to complete your experience or just bring the necessities and let us handle the messy clean up! Start by filling out our contact form at the bottom of this page with as many details that you can provide us or you can give us a call at (309)310-9247 and we can handle it over the phone. You can reserve the studio for any class on the calendar Monday-Friday with a 10 painter minimum, BUT to reserve the studio on Saturday or Sunday it will require a minimum of 15 painters. Private parties of 20 or more painters will also receive a 20% discount on the class price. Any additional time requested for the party beyond the two hours allotted for the painting will be charged at $75 per hour. Our studio accommodates up to 30 painters comfortably. 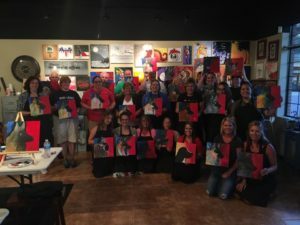 A private event will include your choice of any painting offered in our gallery, 2 hours of professional instructions, all materials needed to paint (easels, canvases, aprons, and all of the art supplies), plates, eating utensils, cups/glasses, and napkins as mentioned above. The entire setup and clean up for your painting party is on the house! We are more than happy to make sure your event is stress free! Also, you are welcome to bring all the food and drinks your heart desires, or if you would like your party catered we can offer some great local suggestions! At Art ‘N Soul we want to make your private event as enjoyable and comfortable as we can. If there are any special requests or needs to make your private party the “bees knees” just give us a call and we can chat about it. We love to hear from our guests! You can also make a note about it in the contact form below and if we have any questions we will call you to confirm. We offer a wide array of paintings that cater to all levels of painters. We also have many paintings that are geared towards the younger crowds, because we LOVE to see the parents and kids get creative! Perfect for your children’s birthday party, there’s plenty of room to bring cake and presents to make for a memorable birthday. Remember kids can paint too! 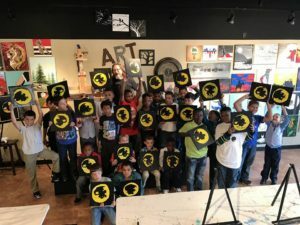 Do you love the Art ‘N Soul painting experience? Are you a bar or restaurant owner? If you answered YES to either one of those questions then contact us to coordinate your next event! 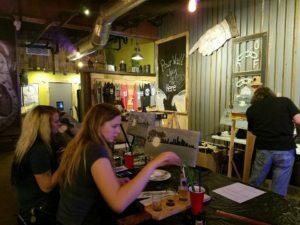 We currently partner with local bar and restaurant owners alike to bring the paint and sip experience to them. There is no minimum number of painters required to use your establishment for the night. Also, there are no hidden fees like travel expense, set up, clean up, and we still provide all the supplies needed for the event. Again, you don’t need to bring anything besides the money you plan to spend on drinks. That’s a win/win! Watch the calendar for an off-site event scheduled that you would like to attend, or request one! Here at Art ‘N Soul, our main focus is on the COMMUNITY! We LOVE giving back to our local non profits every chance we get. We will mark a fundraising “Special Event” for your organization on the calendar and advertise for the event as well. There is no minimum number of painters needed to host a fundraiser, but keep in mind, the more painters = the more money back to YOU! There are no special days for fundraising, we will schedule it on the date that you want it to take place. If you are a local non-profit organization, PLEASE contact us for more information. We do ask that you call (309)310-9247 to make things easier for both us and you. What a fun way to give back to your community !